Conducted by G. Karthikeyan. Open to school students. At 11 a.m. Registration on the spot. The Banyam Academy of Leadership in Mental Health (BALM) hosts ‘Kind Madras’ – Photography contest. Kindness is that most human of qualities that sets us apart, yet few show it consistently. Fewer still exhibit it, regardless of circumstances. No act of kindness, however small, is ever wasted (Aesop). Any act of kindness uplifts both the giver of it, and the recipient. Send us your photographs depicting acts of kindness. There will be two categories of entries, one for those using a camera and another for pictures shot on a mobile phone. The best 3 in each category will be chosen by our esteemed panel of judges comprising film director Mani Ratnam and celebrity photographerG.Venket Ram. Shortlisted photos will be displayed at the ‘Marina’ restaurant, Haddows Lane, Nungambakkam from 22 nd August onwards. Celebrity Photographer G. Venket Ram will distribute the prizes on the 24 th of August at 11 am at the ‘Marina’ restaurant, Haddows Lane, Nungambakkam. Entries can be submitted by mail to kindmadras@gmail.com and photo file size should not exceed 2 MB. Venue: St. Bede’s Auditorium, Santhome. From 12 noon. This Quiz will be conducted by Dr Navin Jayakumar. 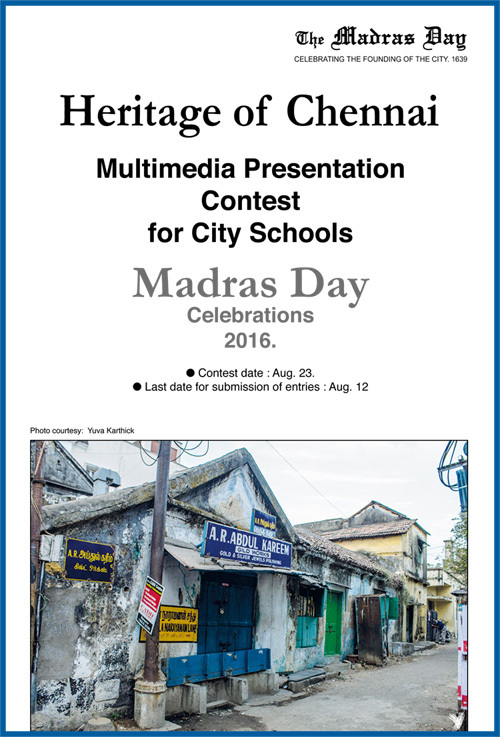 · The Quiz is open to school children between classes 5 and 12 in and around the city of Madras. Open to all. No age restriction. For a team of two to participate. Prelims at 2 p.m. followed by finals. Spot registration. Venue: AMM Matriculation Hr. Sec. School, Gandhi Mandapam Road, Kotturpuram. Prelims start at 1.30 pm. Lady Sivaswami Girls Hr Sec School, Sundareswarar Street, Mylapore. Event supported by Mylapore Times. For Ages 8 years and above. Drawing sheet and color pencils will be provided. The drawing has to be of people or locations or life as it was in MADRAS in earlier times. Gift hampers for winners and participation certificates for all. Photographic Society of Madras (PSM), sharing nearly 16 decades of the City’s history, is holding the ShootMadras photography contest during the Madras Week this August. 1) My Madras The photographer’s personal tribute to Chennai, depicting what it means personally. Including typical Chennai views like beaches, towns, eat outs, city life, cityscapes – Scenes against which day to day life in Chennai plays out. 3) Evolving Madras Shift from the ancient to the old to the modern. Buildings with modern facades, yet vintage structures at the rear. Brand new bridges, flyovers and metro lines. Evolving roads, markets in parallel with structures of yester years. Last date 15 August 2016, 2200 hours. Special Mentions at the Judges’ discretion. And complimentary PSM membership till 31st March 2018 for first and second prize winners. An exhibition of prize winning entries will be held in August 2016. The quiz is open to students of 6th, 7th and 8th Standards only. No participation fee. The quiz is an annual feature and a rolling trophy will be presented to the winning team along with other exciting prizes. The quiz will include various topics on General Knowledge, Heritage & Culture, Current affairs, identifying the artifacts etc. Alliance Française of Madras (AFM) is holding a photography contest during the Madras Week 2016. This contest is open to all residents of the city. Pertaining to the theme, participants can send in their photo entries that depict what the city of Chennai means to them. Photographs may include typical views of the life in the city, cityscape, culture, tradition, day to day life, festivals, nature, wildlife and capturing the magnificence of the city’s architecture from the oldest arch to the modern structures. 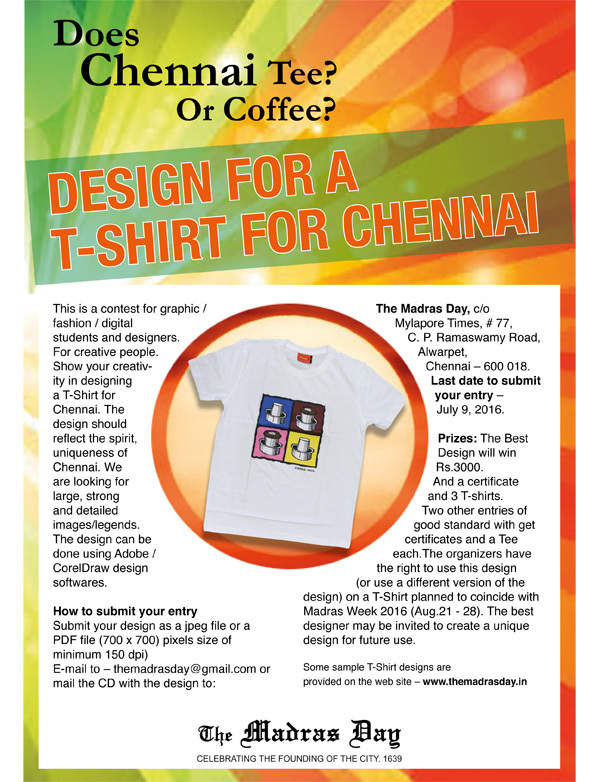 Entries to be sent to communication@af-madras.org and must reach us before 12 Noon on 5th August. 20 entries will be picked by a select Jury and an exhibition of the winning entries will be held at the AFM Gallery from August 22 – 28, 2016. 1. One participant can send a maximum of two pictures. 2. Entries will not be accepted on CD or as prints. 3. Each entry should be accompanied by the following data sheet duly filled in. – Each participant shall submit their photos in TIFF file format (preferred) or JPEG format (as an alternative) with a resolution of 300 dpi. – Any manipulation or modification to the original image is limited to minor retouching of blemishes and cropping and must not alter the content of the original scene. Highly manipulated images and composite images including HDRs are not permitted. Monochrome images are allowed. – Entry is open to all photographers – amateur and professionals. – The original image(s) must have been taken using a photographic process and all entrants must have the sole copyright to each image they submit. Clip Art and Copyright Free material are not acceptable. Alliance Française of Madras assume no responsibility for misuse by anyone of the copyright of published images. – The organisers may reject any entry/image at their discretion. An entry may be rejected if it does not conform to published competition rules or is deemed unsuitable. The entries have to be original work of the entrant, who owns them. The entrants may be asked to provide the original for verification. An entrant failing to provide a requested image file may, at the organisers’ discretion, be considered to be in contravention of the contest rules and will be disqualified. – Notification of results will be sent by email. Entrants should ensure that they provide an active email address and that spam filters are set to accept emails from AFM. Notifications will not be sent by post. – By submitting an entry, the entrant permits the organisers to reproduce all or part of the entered material free of charge for AFM publicity in print or online internet site and/or in other media.